The SpaceX CRS-1 Dragon capsule is stowed safely aboard the American Marine Corp vessel American Islander and is headed to a port near Los Angeles. After arrival and unloading of time sensitive cargo, the Dragon will be shipped to the SpaceX facility at McGregor, Texas where the remainder of the 1,673 lbs of cargo will be unloaded and turned over to NASA. Following that, the Dragon will be analyzed as part of the ongoing process to refine and improve the design for the improved next generation capsule for Commercial Crew, Dragonrider. Apparently, SpaceX once again achieved a remarkably accurate landing very near the recovery vessel, and in doing so continued to demonstrate an ability which will be crucial to future powered landings on the ground. Also of interest is the relatively small size of the recovery operation itself as it exists today. 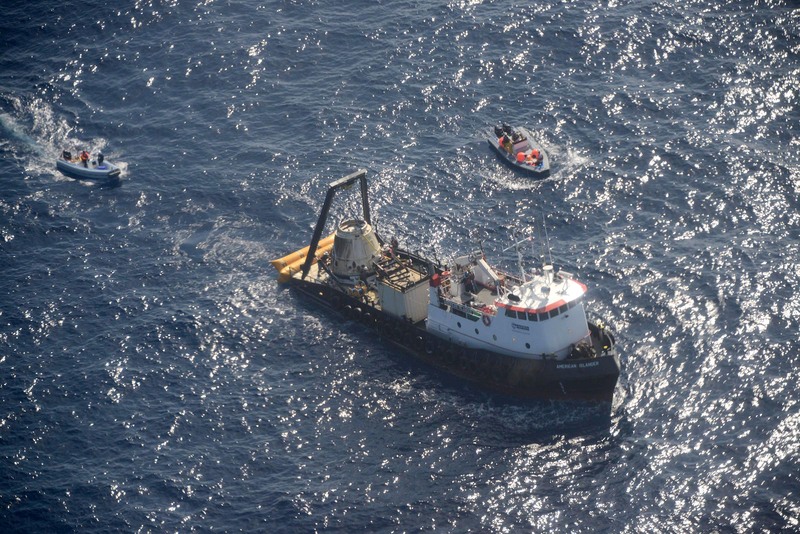 Clearly evident in the accompanying photograph provided by SpaceX, it consists of one very modest commercial vessel, chartered for the occasion, along with a special raft and two zodiacs. This is what routine, practical space recovery looks like, and the fact that there are larger vessels at virtually every upscale marina on the East, West and Gulf coasts should be pause for thought. No aircraft carriers required. For anyone interested in following the progress of the American Islander as it heads for home, marinetraffic.com is one of several sites which provide a searchable database showing the location of ships and private vessels equipped with an AIS locater. Automatic Identification Service is a product offered by SpaceX customer Orbcomm, currently through two small satellites out of Luxembourg. The service will expand significantly after the launch of its second generation fleet of satellites beginning next year.